Winter is almost over and we all hope that warm, spring days will visit us shortly, but are we all ready for it? After months spent in overheated, air-conditioned rooms our skin has dried out, most likely dull and “grey” looking; it doesn’t look its best. We would all love to have shiny, healthy and young looking skin but not all of us are this lucky. So for those of you who need some help in getting the most from your skin I have a secret – Moisturise! Most of you probably think at this moment, why is it a secret? It is common known fact! Yes, I agree, the fact that moisturising will help your skin look its best is not a secret, but the way to do it quick, cheap and effective, is. So where does my secret lay? This magnificent plant holds the secret to beautiful and moist skin. It will moisturize it, keep it hydrated for longer and make it look fresh and healthy. As an extra benefit it might get rid of any spots you have and ease any redness or over dry discomfort you might feel. There are two ways of using this “magic” plant – easy way, which will take longer for the effect to accrue or a slightly harder one, but you will see the results within days. Purchase a good quality Aloe Juice, but instead of following instructions on the bottle, use it as a tonic water – at least twice a day. You can of course drink it as well, in order to get other benefits from this fabulous plant. 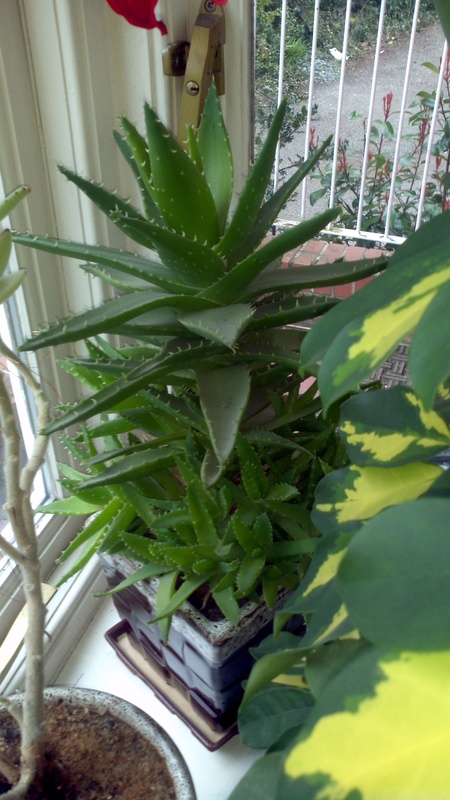 Buy yourself an Aloe plant. When choosing the plant, please make sure that your specimen has quite wide and large leaves, as they will hold the most juice. Pick a leaf, cut it at the angle close to the bottom of main plant. Split leaf in half and gather all the juice. As described above use it as a tonic water for your face, neck and bust line. If you have time you can always make a leaf mask, simply by placing open, freshly cut, still moist leaves on your face (use the leaves after you have gathered the juices from them). When using juice directly from the plan you should see an effect within 3 to 7 days, depending on how dull and dry your skin is. I discovered all of this some time ago, when my friend had burns on her face. She was advised to use Aloe juice in order to help with pain and speed up the healing process… but after a few days we noticed that the juice did much more than just help with healing the burnt part, it made her skin much more moist, radiant and generally healthier looking. With all of this now written down, please remember that all things are good in moderation. So do not splash aloe juice on your face all day long while forgetting about the other basics. In order to keep your skin looking younger and healthier for longer, please do not forget that you also have to keep your whole body well hydrated. Aloe grows fast, so once you buy a plant and care for it well, you will be able to use it for many years to come, so happy growing leads to happy moisturizing. * This post is my entry for Tria Beauty UK competition, where one entrant will win a Tria Hair Removal Laser! Wow! To find out more please visit Tria Facebook page. Yep, when hubby and I got sunburnt on vacation last month, I made good use of an aloe plant growing just outside our villa!! Just cut off some leaves and rubbed the juice on our burns! Nothing’s better than nature! Hi Mary, did you ever try aloe? It really does wonders.